Every POS system is different. You may think that one-size-fits-all for each POS system, but that’s not the case at all. For those who are newer to the business world, a POS — or a point of sale — system is a tool that many merchants use to make business transactions easier. It is a crucial part of business because it makes inventory, targeting your desired audience, and seeing the results you want much more efficiently. Instead of using a simple cash register, this secure piece of technology will meet your daily demands and more. 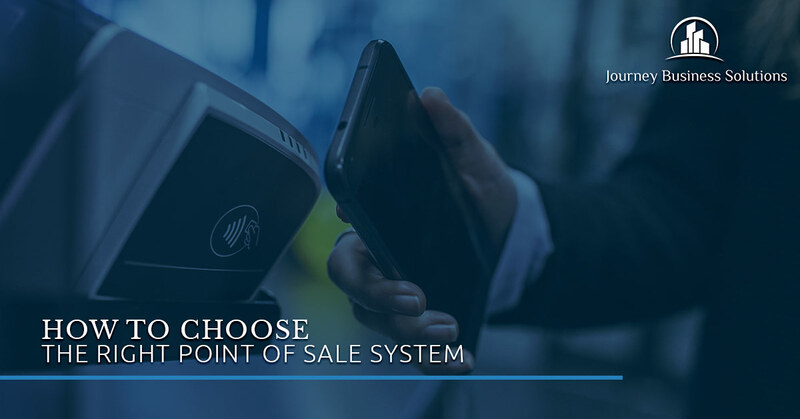 However, since there are so many options out there, how do you choose the right point of sale system for your business? Some have more bells and whistles than others and many systems are you get what you see. At Journey Business Solutions, we offer merchant services that make it easier for you to have a successful business. Whether you have a restaurant, retail store, or you’re a startup business, our POS systems are an essential part of doing business. Our systems are great for inventory management, employee scheduling, sales tax management, loyalty programs, and more. We have the Clover Station, VX 520, MYNT POS, and more. Customer service: You’ll want to meet the demands of your customer or client base. With the POS system, you can process each customer transaction easily and efficiently without any type of connection failures. You’ll want a system that has loyalty program access as well to create incentives for your customers and client base. Reports and analyzing: Reporting and analyzing the numbers in your business is one of the most beneficial factors of a POS system. The POS system is a great tool to gather the information you need to target your customers and client base better as well as prepare your budget and keep track of the volume of people who come to your business. Personalization: Customizing your POS system will make your operations much more personable. The providers will offer you a more industry-specific feature to make it easier to run your business. Security: With so many breaches in security due to hacking, a secure system is vital for keeping your customers feeling comfortable anytime they come to your establishment. Whether you’re a small business or it’s just you selling art, a secure POS system will keep customer and credit card information private. In today’s world, it’s standard to adhere to the expectations of security, especially because so many reputations have been damaged due to breaches. Scalability: If you’d like to have a bigger business, then make sure that your POS system can handle that. The POS systems we offer are designed to be powerful and make it easier for you to manage business decisions. Easy process for inventory management, exchanges, and returns: Inventory can get confusing when you have returns and exchanges. It’s essential that you can easily do inventory as well as allow your customers to exchange and return products. Hardware Needs: A POS system starts with the software. There are be cloud-based POS systems as well as more traditional systems that have terminals and receipt printers for large scale purchases. Easy To Use: Overly complicated systems can be more difficult for you and your employees to learn. Eliminate complications by going with a POS system that offers what you need while going above your expectations. Contact us to learn more about our POS systems.